If you’ve worked with Google+ page listings in the past you know they’re a great asset for businesses and online marketers. However, adding listings, managing locations, maps, and linking all of the individual Google features together can prove difficult. The good news is that Google just launched Google+ business pages or Google My Business, a platform for businesses that integrates Google+ pages, reviews, YouTube channels and other Google features into one convenient platform. The new function simplifies all the business-related functions for online marketers and business owners. Before you get started launching your business into online success, we’ve created a list of 3 things to know about Google’s new business pages to help you navigate, set-up and understand how to utilize the updated platform. 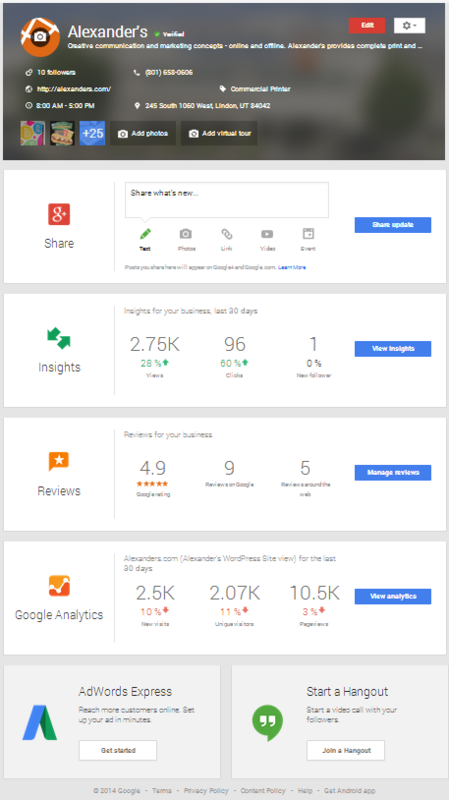 Google My Business now puts everything in the same place—maps, listings, reviews, analytics, Google+ sharing and even YouTube stats. The page layout is clean and intuitive, with a row at the top for the listing info, and subsequent rows beneath for each of the page’s functions. Users can share Google+ statuses from their dashboard, check their page views and interactions, respond to reviews, and monitor their analytics. If your business has a storefront or a listed address, you can attach your listing to Google maps. If you service an antire area (i.e. pizza delivery, taxi service, etc. ), you can set-up your page based on a larger area. Brands without a set location (bands, sports teams, causes, etc.) can also have a page independent of any geographical listing. Google also allows businesses to manage multiple locations at once. Those that have 10+ locations can input each location into the Google My Business feature and change listing info (hours, websites and phone numbers) for each location. If a Google business listing has already been made, transferring over to the new business platform will not require much effort. When our team at Divvy and Alexander’s transferred their page, they simply signed into their existing Google+ pages and the switch was seamless. If you want more information about how to leverage social media for your business, please contact us.